Yes, I’m a little dump cake obsessed right now. A reader asked if I could post a video on how to make my pineapple cherry dump cake. I didn’t think to film it the other day (just took pictures) and am a bit camera shy, but I did find a great video for you here. There are a couple of things I really like about this. Adding cream cheese to the basic recipe is such a great idea and it will make it even richer and creamier. I also like the fact that she cut the recipe in half and is making it in a pie dish instead of a big 9×13 cake pan. Perfect for a small family like ours (even though the big batch of cake didn’t last very long). Spray the pie dish with non-stick spray. Spread the pie filling in the bottom. Cut the cream cheese into small chunks and spread them out over the pie filling. Top it with the pineapple chunks. Pour the dry cakemix over everything and spread it out evenly. Pour the chopped nuts on top. Cut the butter into slices (or pads) and lay them on top of the cake mix. Bake at 350 for 20 minutes or until the top is brown and bubbly. Serve hot out of the oven with ice creme. What a perfect way to make a simple dessert every one will love. 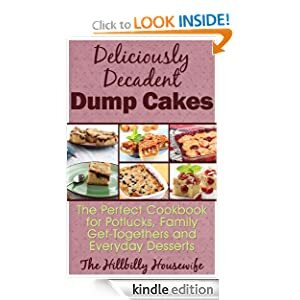 Get “Dump Cake Recipes – Desserts So Easy Even Kids Can Make Them” today.